Scientists, theologians, and philosophers have all sought to answer the questions of why we are here and where we are going. 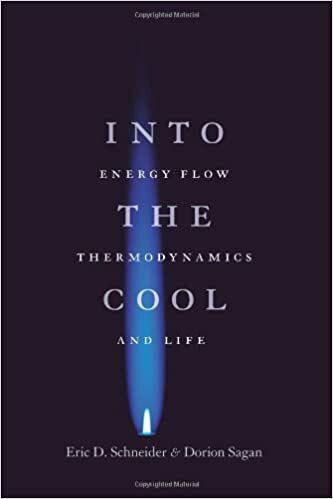 Finding this natural basis of life has proved elusive, but in the eloquent and creative Into the Cool, Eric D. Schneider and Dorion Sagan look for answers in a surprising place: the second law of thermodynamics. This second law refers to energy's inevitable tendency to change from being concentrated in one place to becoming spread out over time. In this scientific tour de force, Schneider and Sagan show how the second law is behind evolution, ecology,economics, and even life's origin. Working from the precept that "nature abhors a gradient," Into the Cool details how complex systems emerge, enlarge, and reproduce in a world tending toward disorder. From hurricanes here to life on other worlds, from human evolution to the systems humans have created, this pervasive pull toward equilibrium governs life at its molecular base and at its peak in the elaborate structures of living complex systems. Schneider and Sagan organize their argument in a highly accessible manner, moving from descriptions of the basic physics behind energy flow to the organization of complex systems to the role of energy in life to the final section, which applies their concept of energy flow to politics, economics, and even human health. A book that needs to be grappled with by all those who wonder at the organizing principles of existence, Into the Cool will appeal to both humanists and scientists. If Charles Darwin shook the world by showing the common ancestry of all life, so Into the Cool has a similar power to disturb by showing the common roots in energy flow of all complex, organized, and naturally functioning systems.